This holiday season, home cooks will be able to purchase the premium potato that professional chefs in Maine have loved for years. Cold River Gold is now available to consumers at select retailers in New England. Distinctive new packaging made of craft paper – and visual art work that celebrates the Cold River and its unique growing region – makes the new brand easy to find. Duckfat, in downtown Portland, Maine, uses the chef-size version of the Cold River Gold variety to make their award-winning Hand Cut Belgian Fries. Newcomer Noble BBQ uses it for their Scrappy Fries, a pile of twice-fried French fries, baked beans, and butcher’s meat scraps. But fries aren’t the end of the story. Figgy’s Takeout & Catering, in the West End neighborhood of Portland, uses Cold River Gold to make their Buttermilk Mashed Maine Potatoes. 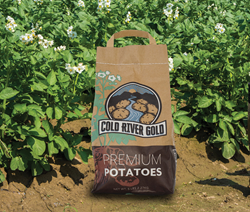 In addition to its versatility, Cold River Gold premium potatoes maintain their texture, yellow-gold color, and intense flavor every single time you cook it. Because they take longer to grow, they keep longer than most other varieties. Green Thumb Farms is a 2,200-acre farm nestled in the heart of the Mount Washington Valley in Fryeburg, Maine. The region offers the perfect growing conditions for Cold River Gold potatoes. Pure, mineral-rich water from the Cold River Valley feeds the plants, while a static water table keeps them steadily hydrated with the water they need. The Mount Washington Valley holds heat like a pocket, which creates a warmer micro-climate that extends the growing period. Plus, sandy soil with no rocks means less bruising for the potatoes. A third-generation family business, Green Thumb Farms has been farming in Western Maine since 1965. Their agricultural roots lie in the production of the highest quality potatoes – from seed selection to harvest – while state-of-the-art technology ensures that only the best potatoes go into every bag. To learn more about Green Thumb Farms, or to find recipes for Cold River Gold potatoes, visit here..
See the Cold River Gold video here. Follow Green Thumb Farms on Facebook! Can I “green” the potatoes and plant them I live just south of Boston in Weymouth. Shaw’s had them today for the first time. To me it looks like the potatoes we used dig and put into wooden barrels. That was a long time ago. The potatoes that we have been getting are terrible – green, sprouting, black spots through the potato – I end up sending about half of the potato to my worm bins. Thank you for your inquiry, I’m sorry to hear you’ve been having bad luck with the potatoes from your grocery store. I hope our potatoes served you much better! In regards to using them as seed, you could certainly give it a try but there is no guarantee that they will grow well since they were not raised and stored with the intention of becoming seed potatoes. Either way I hope you continue to enjoy our Cold River Golds!